Especially after that great justifying I did! I'm the princess of justification... my mother is the queen! Anyway... 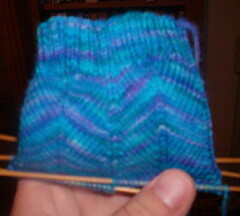 I started the Jaywalker socks the other day. The picture is not the greatest (taken at night with flash), but you get the idea. Well, I'm trying not to think of every twinge as a symptom if ya know what I mean. It's so hard not to though. Not too much longer until I know for sure! Argh... I hate the two week wait! Write more later!